LeftyBassist.com • View topic - Jaguar Bass aged Olympic White Medium Scale 32"
Jaguar Bass aged Olympic White Medium Scale 32"
Post subject: Jaguar Bass aged Olympic White Medium Scale 32"
Got this a little while ago but want to find a new home for it as I already have some nice PJ basses. I've got this already as a parts bass, but at the time the action was way high and I realized the neck pocket was too deep for a Fender neck so I had the local guitar repairman cut a proper shim to fit the entire neck pocket and it worked out great, this bass plays just like it should, nice low action, great sound from the ivory EMG-X pickups and great sustain having the string thru bridge. The previous owner drilled through the body and you can see that one of the ferrules is slightly closer to the other but it doesn't affect anything. 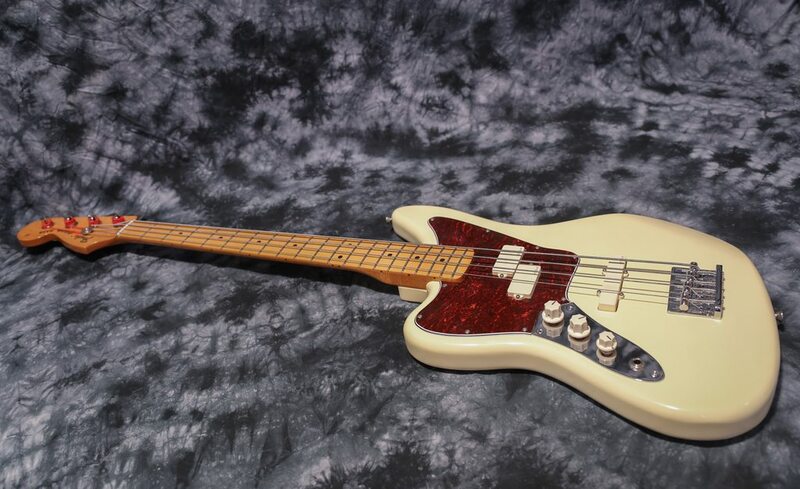 The neck is a rare Fender Pawnshop Reverse Jaguar medium scale in a beautiful vintage tint and is really nice to play. This neck has dots on both sides from factory. I have a receipt showing the work done to the bass: Shim, fret work and setup. Would like to get $400 shipped CONUS. I could also sell it overseas but that would be the actual price plus shipping. Trades? Possibly but prefer selling it. 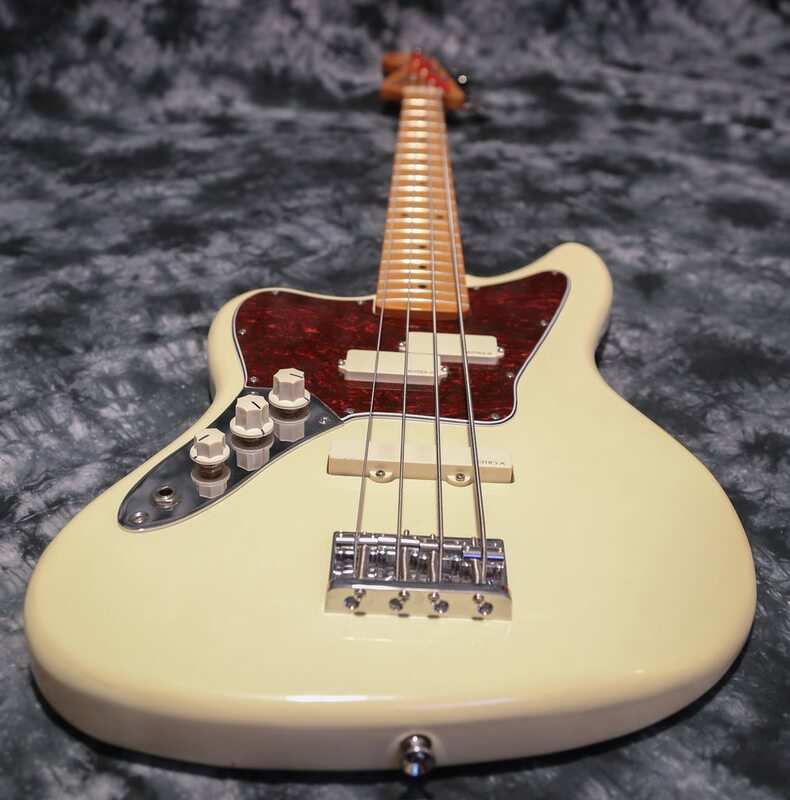 Post subject: Re: Jaguar Bass aged Olympic White Medium Scale 32"
How many basses you got now Paulo? Like the color of that one. I dig the aged white color! How many? Haven't counted but less than 20! Why am I thinking there are 4 firetrucks outside your house right now? A friend of mine (righty) offered good money for the neck alone but I refused right away, would hate to take such a nice bass apart...! Lookin' good Paulo! I love your project basses. Always turn out so tasteful! Paulo wasn't there a guy in the UK looking for a medium scale fender? More like 1.5x the way there!